"White-tailed Deer" refers to the white underside of the tail, which is held conspicuously erect like a flag when the animal is alarmed or running. The adult White-tailed Deer has a bright, reddish brown summer coat and a duller grayish brown winter coat. White fur is located in a band behind the nose, in circles around the eyes, inside the ears, over the chin and throat, on the upper insides of the legs and beneath the tail. The young, called fawns, have reddish coats with white spots. Adult males, called bucks, inhabiting the deserts tend to be smaller than their eastern relatives, which can weigh 300 pounds. Desert White-tailed bucks average about 200 pounds and stand about 3 1/2 feet high at the shoulders. As in most deer species, the females (does) are smaller, with an average weight of about 125 pounds. Throughout North America from southern Canada through Central America. White-tail deer inhabit most of southern Canada and all of the mainland US except 2 or 3 states in the west. Their range reaches throughout Central America to Bolivia. The Cervidae Family includes deer and their allies, including moose, elk, and caribou. All have slender legs. Most are brown or gray in color, with white spots characterizing the young, and in a few species, the adults. 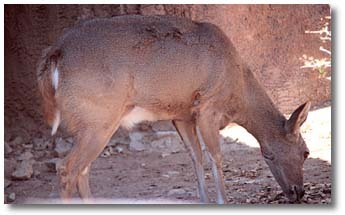 The White-tailed and its cousin the Mule Deer, are the only members of this family found in the North American deserts. Antlers (solid horns) distinguish most of the 3 dozen species of the deer family from the other hoofed mammals. Unlike most other hoofed mammals, which have permanent, hollow horns, only male deer grow antlers, which they shed each year. The closely related Mule Deer (O. hemionus) are more commonly found in the North American deserts and throughout the West. In desert regions they are somewhat larger and stouter, have larger ears and tails tipped with black. White-tail deer are not especially vocal, although young fawns bleat on occasion. Injured deer utter a startlingly loud "blatt" or bawl. Whistles or snorts of disturbed White-tails are the most commonly heard sounds. 4-10 inches white underside of the tail, which is held conspicuously erect like a flag when the animal is alarmed or running. White-tailed ears are considerably smaller than Mule Deer ears. Deer are extremely cautious animals with keen senses of smell and hearing. Both White-tailed and Mule deer can run as fast as 40 miles per hour and are good swimmers. The basic social unit is a female and her fawns, although does have been observed to graze together in herds of up to hundreds of individuals. In the deserts, deer often migrate from higher summertime elevations downslope to warmer climes where more food is available. When a number gather together trampling down the snow in an area, it is known as a "deer yard." Except for the mating season, bucks and does remain apart. Bucks generally live alone or in small groups with other bucks, while does live alone or with their fawns and female yearlings. Deer generally prefer open woodland, but are often found on the fringes of urban areas and in farming country, but desert species can occur in most habitats within 10 miles of a water source. They often enter human inhabited areas and feast on flowers and grass as well as regularly getting a drink from man's abundant water supplies. Some deer have also taken to eating garbage and plastic which is not at all good for them. Recently. A number of deer had to be sacrificed at the Grand Canyon after having eaten human trash which stopped up their systems and caused them not to be able to process food. White-tail deer feed on a variety of vegetation, depending on what is available in their habitat. They are browsers feeding on twigs, leaves, bark, shrubs, the fruits and nuts of most vegetation, as well as lichens and other fungi. In desert areas, plants such as huajillo brush, yucca, prickly pear cactus, comal, ratama and various tough shrubs may be the main components of a White-tail's diet. Conifers are often utilized in winter when other foods are scarce. White-tail deer feed mainly from before dawn until several hours after, and again from late afternoon until dusk. Bucks develop a pair of spiked antlers by the fall of their second year, when they become fierce fighters for the autumn mating season. Winners of head-on clashes are awarded mating privileges with the does in the vicinity. Age, genetics and nutrition determine antler size, which establishes social status among the males. Large-antlered bucks, with their intimidating racks, mate more frequently. Does are seasonally polyoestrous and usually come into heat in November for a short twenty-four hour period. If a doe is not mated, a second oestrus occurs approximately 28 days later. Mating occurs from October to December After mating, bucks shed their antlers and grow a larger set between January and April. In early summer, after a gestation period of about 200 days, does give birth to one or two young. Fawns weigh 5 to 8 pounds at birth, but quickly gain weight and can run within a week. Cared for only by the mother, she nurses them for about 5 weeks before weaning. Fawns are able to walk at birth and nibble on vegetation only a few days later. They are weaned at approximately six weeks. Females generally follow their mothers for about two years, but males leave the group within the first year. Bucks may form transient groups of 2-4 in the summer, but these disband prior to the mating season. Males begin rutting as early as September, and at this point become entirely preoccupied with obtaining matings. They do not guard harems (as with elk) but rather fight each other individually, clashing antlers to gain access to a particular female. White-tail does are painstakingly careful to keep their offspring hidden from predators. When foraging, females leave their offspring in dense vegetation for about four hours at a time. While waiting for the female to return, fawns lay flat on the ground with their necks outstretched, well camouflaged against the forest floor. Fawns withhold their feces and urine until the mother arrives, at which point she ingests whatever the fawn voids to deny predators any sign of the fawn. Life span in the wild is 10 years, but White-tail deer have lived up to 20 years in captivity . Adult deer have few predators except for humans, Mountain Lions and wolves, where they still exist. Coyote predation on fawns can be considerable, accounting for as much as 40% of fawn mortality in some areas. State fish and game agencies regard deer as a renewable, harvestable resource for viewing and hunting. Sport hunters bag about 1 million Mule Deer and 2 million White-tailed Deer annually. The National Park Service estimates that between 23 and 40 million White-tailed Deer inhabited North America before the arrival of Europeans. For a number of years the population was greatly reduced in the U.S., due to habitat loss and unrestricted hunting. But by the mid-20th century, the population has been restored throughout North America. Today, an estimated 14 to 20 million are believed to inhabit the United States alone, and in many areas of the eastern U.S. populations have soared to previously unattained levels. Experts cite various reasons for this reversal, in addition to the behavioral flexibility of deer. An increase in food supplies has been accompanied by a decrease in the natural predator populations of Wolves, Coyotes, Mountain Lions and Bobcats, which have not survived urbanization. Game management measures have placed restrictions on hunting seasons, bag limits and available lands for public hunting, while establishing artificially protected habitats in state and national parks. Recently, the National Park Service, noted that it may need to begin "managing" the deer population in about 50 eastern parks because deer over-browsing is causing the destabilization of park ecosystems. 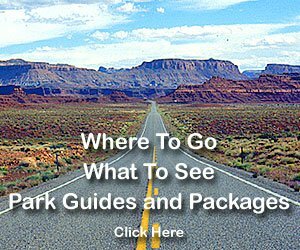 Injuries to park visitors from contact with deer that are perceived as tame, collisions of motor vehicles with deer, and damage to crops, ornamental shrubs and flowers in historical parks were also cited as increasing problems by the NPS. U.S. ESA - Endangered as O. v. clavium and O. v. leucurus; IUCN - Rare as O. v. clavium. White-tail deer are destructive to crops, vegetable gardens, fruit trees and the like where their ranges overlap with human habitation. When their numbers become too high, White-tail deer can cause serious damage to forest vegetation through overbrowsing. They are involved in accidents with cars, often resulting in serious injury to the human occupants of the vehicles.